The Sounders have appealed a red card and automatic suspension handed Sounders defender Chad Marshall for a dangerous foul late in Saturday's win over Sporting Kansas City. In a rare move, the officiating crew invited a Seattle Times pool reporter into their locker room postgame to explain the call. Standing inside a referees’ locker room at CenturyLink Field was the last place I’d expected to be after last weekend’s Sounders contest ended. But in the 77thminute, Sounders center back Chad Marshall upended Sporting Kansas City forward Johnny Russell on a play ultimately sent to video review and ending in a red card disqualification for a dangerous foul. As the pool reporter assigned to ask about controversial calls postgame, I scribbled out a simple question asking head referee Baldomero Toledo what he’d seen to merit ejection, then was escorted across the field to the officials’ room to hand deliver it. 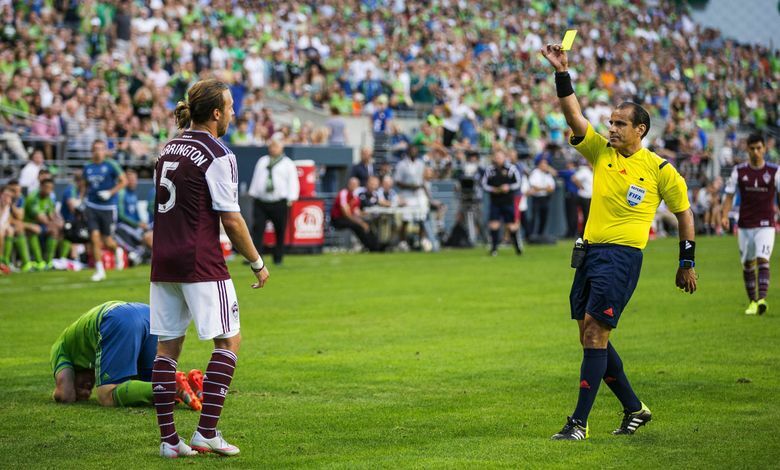 The Sounders on Tuesday confirmed they’ve appealed the red card and Marshall’s automatic one-game suspension. And sources within the team were feeling confident about getting it rescinded and having Marshall — a strong candidate for Defender of the Year honors — eligible for the team’s next match at Vancouver on Sept. 15. But regardless of what happens next, my postgame goal Saturday was hearing from Toledo on why he saw things differently than the stadium full of fans that spent the final 10 minutes booing him vociferously. I’d been warned not to expect much: That MLS officials rarely respond to questions on video review calls and the most I’d get is a short, hand-written reply. Outside the locker room, accompanied by a Sounders official, we were met by a referee’s liaison who took my written question and told us Toledo would have up to 15 minutes per league rules to decide whether to respond. I’ve never been big on overplaying officiating calls in stories. Most officials are just trying to earn a living and the way they get to keep doing that is by getting as many calls right as they can. They don’t get them all right; but are judging plays — and even replays — in a hurried state that requires snap judgments after only a few looks at most. But I’ve never met with officials right after a game, or been inside their locker room. For all the notoriety they get, a shroud of secrecy and necessary distance is generally kept between them and the public. This seemed a rare chance to glimpse beyond that. And after what felt like the full 15-minute delay allotment, the referee’s liaison opened the locker room door and, to our surprise, waved us in. Toledo was standing at the center of the room, still in uniform, my question in-hand and his written response underneath it. His assistants were changing in a row of lockers directly opposite him. Before we could continue speaking, Dave Gantar, the Video Assistant Referee (VAR) that had flagged Toledo to review the Marshall play after no call was initially made, came over holding a smartphone. “Look at the play,’’ Toledo implored, nodding his head toward the phone. Gantar began replaying video of the incident. “You see, the angles that were shown (on TV) apparently don’t show this,’’ he said. At this point, Toledo and the other assistants nodded in agreement. Gantar continued on, explaining that the ball was going in a different direction from Marshall when he had already started thrusting out his leg towards Russell. Again, Toledo animatedly nodded in agreement. “I don’t know if this is helpful to you, or not,’’ Gantar said, motioning to the video. I assured him it was. Indeed, the replay showed Marshall lifting his foot off the ground and starting to thrust his leg towards Russell a split second before the ball eventually changes direction after striking the oncoming SKC player. Only then does the ball head back toward Marshall and deflect off him as his foot strikes Russell. Other, similar replays I’ve since looked at outside the room show the same thing. Some plausible defenses of Marshall I’ve since heard expressed are that he’d instinctively tried to block a shot or pass. That he stuck his leg out anticipating the ball eventually deflecting off Russell’s feet and coming back towards him — which it did — and that he inadvertently struck the opponent’s knee with his cleats in doing so. They argue that while it was certainly an inadvertent foul, it lacked the force, intent and intensity to be a red card. In fact, those are almost certainly arguments the Sounders used in their appeal. But to officials inside the room: Marshall was playing the man instead of the ball and could have broken Russell’s leg. “Then, no problem,’’ said Toledo, finishing his sentence. At that point, assistant referee Ian Anderson jumped in. “So, are you going to photograph this and publish it to the world on Twitter?” he said, motioning towards Toledo’s handwritten explanation. Toledo burst out laughing. But Anderson appeared deadly serious. I assured him I would not. The Sounders team representative assured them he’d type the response up for the media. Gantar and Toledo thanked me for taking the time to hear them. They said the relationship between referees and the media has been rocky and that they need to do a better job of explaining their reasoning behind calls. And they’d done just that, in some of the most detailed manner an MLS officiating crew apparently ever has. Their arguments might not survive an appeal that scrutinizes more video angles frame-by-frame for hours at a time, but at least we know why the call was initially made. And issues the Sounders will have to tackle to get it overturned.